On January 10th the latest study have been published in the Leukemia magazine. The study was focused on the effect of B-cell receptor signaling pathway inhibitors on surface CD20 levels and antitumor efficacy of anti-CD20 monoclonal antibodies. For the first time researchers have reported that blocking the activity of BCR signaling pathway using small molecule inhibitors leads to dramatic decrease in surface CD20 levels as assessed in a panel of 16 cell lines and 30 primary B-cell tumor samples. As a consequence, inhibition of BCR signaling pathway leads to substantial decrease in antitumor efficacy of anti-CD20 mAbs. Published results are of great clinical importance and indicate that therapeutic modalities combining BCR inhibitors and anti CD20 mAbs should be introduced consciously and in well planned schemes. 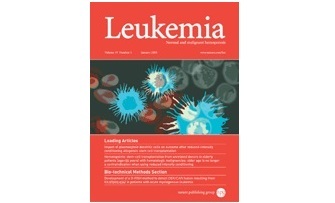 Leukemia journal is part of the Nature group. Magazine Impact Factor is 10,164. The authors of the paper: Kamil Bojarczuk, Marta Siernicka, Michał Dwojak, Małgorzata Bobrowicz, Beata Pyrzyńska, Paweł Gaj, Marta Karp, Krzysztof Giannopoulos, Dimitar G Efremov, Cyril Fauriat, Jakub Gołąb oraz Magdalena Winiarska. BASTION project has received funding from the European Union’s Seventh Framework Programme for research, technological development and demonstration under grant agreement no 316254.